Now usually, I’m all about the turkey leftovers this time of year, but I fell and hurt my left shoulder and right ankle. Now that wasn’t all so bad, even though I sometimes have to pick up my left arm and move it with my right hand I was getting on. Now my right hand just decided not to work at all so I’m down to one-handed typing – and even worse wearing stretchy pants & slippers. My turkey meat is in the freezer and I’m going to be going through my archives and finishing up some almost done posts and Ina’s fabulous guacamole is one of them. And it’s not like I don’t already have a guac recipe on my site already, Bon Appetit’s Best Guacamole and I haven’t even ever posted my own, but just like shoes, I guess – ya can’t have too many guacamole recipes! Besides Ina Garten’s Guacamole is the ideal complement to the gorgeous Salmon Sandwich that goes with it. There’s just something about this particular guac that just makes the sandwich. I know because I tried my own guacamole on it when I made it a second time and it just wasn’t the same. I’ll be posting that Salmon Sandwich next. Ina Garten’s Guacamole is quite a bit different than most I’ve had. There’s no tomato or salsa type of a flavor at all. And it’s funny how changing up just a few ingredients in guacamole can give a whole different taste. 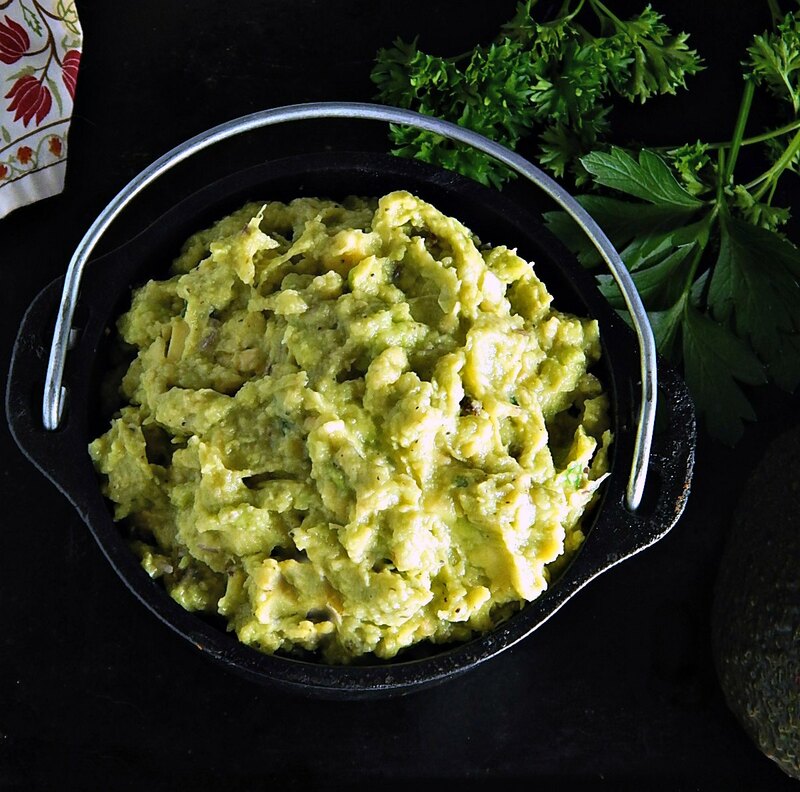 This guac is heavy on the lime (I would never dream of using so much lime but it just works!) and has two kinds onion – green onion and red along with just a touch of garlic and a smidge of jalapeno. It’s zippy and bright and the flavors complement the avocado and ring out clear and true. The guacamole has quite a bit of salt and if you’re using Ina Garten’s Guacamole for dipping chips, cut back on it; with the salty tortilla chips the salt in the guacamole is a little much. But if you use this Guacamole for the Salmon Sandwiches (which will be the next post) the salty guacamole, along with the bacon just makes the sandwich. In that case, you might want to use the full amount. I already mentioned the salt in the guacamole, but just one more thing about that. Ina, and many chefs call for kosher or sea salt and I usually just convert them for my cooking. Unless I’m sprinkling a special sea salt over something where it really matters, like a finishing salt, I use table salt. For one thing, it table salt dissolves quickly with no effort while some of the kosher salts don’t and for another table salt has a little iodine in it. Since I’m pretty much a scratch cook and don’t use many items that have salt added, that touch of iodine can help prevent goiter. Yeah, and table salt is cheap, too. And I use this conversion table from Morton’s pretty regularly. It’s so helpful. With all the citrus in this guacamole, it stores and keeps very well so it’s a perfect make-ahead guacamole. Just cover it tightly, pressing your plastic wrap right on to the guacamole and it will be as fresh as the day you made it, even a day or two later. With just a tablespoon of jalapeno, there’s not much heat in the guacamole. As with any guac adjust it to your taste. In my area, avocados do go on sale regularly. I just love them and like to have them on hand, even if they can be a little spendy. There are so many health benefits from the simple avocado that I still think it’s a great value, especially during the summer when they’re at a low. I think everyone considers them to be a superfood these days, and here’s what the World’s Healthiest Foods has to say about them. It’s a worthwhile read with lots of surprising avocado health facts. If avocados are on sale I pick up what I need for the current week and then a couple for the next week or two…I specifically look for the hardest ones to slowly ripen on the countertop. Although most people don’t refrigerate avocados, once they’re ripe and you’re hoping to get a day or two more out of them before you need to use them, toss them in the fridge where the ripening process slows down and they’ll hold better. If you need to speed up that ripening process, put your avocados in a bag with a ripe banana and they’ll ripen faster. A single jalapeno doesn’t cost much but in some stores (Aldi for instance) you can only buy them in a pack. I like to roast them all, then peel and deseed them and toss them in the amounts I’ll use in the freezer, usually two to three to a package. Then I have jalapeno ready in a minute or two if I want to make a quick salsa. Full instructions are on my post for Best Instant Pot Chili. And don’t forget to regrow your green onions in a jar of water on a sunny windowsill or in a pot of dirt (I just stick them in amongst my herbs or plants.) They’re handy to have on hand. Place the avocados, lime juice, scallions, red onion, jalapeno pepper, garlic, 1 teaspoon salt, and 1/2 teaspoon pepper in a mixing bowl and mash roughly together with a fork. Taste for seasoning; it should be very highly seasoned. I’ll be sharing Ina Garten’s Guacamole at Fiesta Friday #252, and the co-hosts this week are Alex @ Turks Who Eat and Zeba @ Food For The Soul. Stop by and check out Fiesta Friday and Alex and Zeba’s sites; you’ll love them all! This entry was posted in Click here for Fabulous Food Posts and tagged Appetizer, Avocado, Green Onion, guacamole. Bookmark the permalink. I am so sorry you fell and were injured. I send my wishes and prayers for a speedy recovery. What a frustrating thing to happen so close to the holidays. I hope you have lots of help and can use this to get a good rest. Hi Liz, thanks! I’m itching to get into the Christmas recipes but You’re right about the rest – which is always hard for me. I always seem to be spread in all directions all the time! I saw Ina and I jumped LOL! Wonderful fresh ingredients, there’s nothing quite like a good guac recipe and this is IT! I confess to being a major guacamole snob, but being from New Mexico, I feel I have the right. This looks like a delish version. I do think that the addition of 2-3 minced garlic cloves makes all the difference. But that aside, onion and lime and salt are crucial components. I also like it with freshly chopped cilantro. This sandwich, with the croissants, looks AMAZING! This is a great recipe for guacamole! Beautiful and I love those croissants photos! Actually Ina’s might be more authentic than what I do, because I like to include some kind of tomato or salsa in mine. But nonetheless one of my favorite things to eat, cause you get to eat chips, too!